This Still life table is a smaller version of Still Life Table model 220, but without Perspex cover. This is ideal for small product photography. 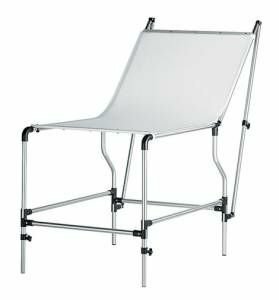 An adjustable tilting back and adjustable legs make this ideal for special set ups. Silver color; distance from floor to flat surface: 27.56 in. ; height: 61.81 in. ; load capacity: 22.05 lbs; material: aluminum; panel size: 150x78cm. ; weight: 15.43 lbs.